What you should know: Bamboo flooring may be nailed or glued down over wood sub-floors or glued directly to concrete sub-floors on, above, or below grade (i.e. basements). All planked flooring should be installed perpendicular to your flooring joist. 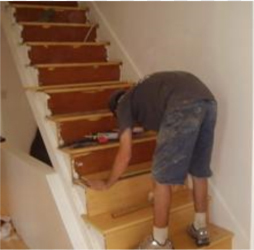 Nail down installation is most commonly used over wood sub-floors. A bamboo floor can be glued directly to concrete sub-floors on or above grade. The flooring may be floated within certain dimensional limitations (not to exceed 16 inches in width without an expansion gap for solid bamboo construction) and with a proper moisture barrier. Ask your bamboo floor wholesale supplier or manufacturer for recommendations on installation. The nail down application is best suited for installation over an existing hardwood surface. Nailing your bamboo floor is relatively quick and easy. depending on yourbamboo flooring installation professional, nail down installation can be less expensive than glue installation. If you are installing your own bamboo floor, renting equipment is costly. Read below for more information on nail down installation. Note: If you are installing Radiant Heat bamboo floors, you should not use nails. Glue down is a safe and comprehensive installation method. Gluing directly to a concrete slab may be done at or above grade. do not use glue to install below grade. Always check with your bamboo flooring supplier, but in general gluing down your floor is almost always an acceptable and secure process for installing bamboo floors. Note: Glue is so secure that once it if fully installed it is very difficult to uninstall. Read below for more details on gluing down bamboo flooring. Floating a bamboo floor is also relatively easy. Floating a floor simply means the tongue and groove are linked together and that is the only way that the floor is held together. This type of installation is only recommended for engineered and radiant heat flooring. Check the general conditions in your house. In the area to be installed, temperature and humidity should be brought to normal occupancy levels for a minimum of 72 hours before installation and maintained at those levels after installation. Some areas may require more time for proper acclimation. Be sure the job is closed in, with all outside windows and doors in place. Excessive moisture caused by the slab or plaster drying out should be dissipated before the flooring is placed at the job-site. Flooring should be removed from the box and allowed to acclimate on site at least 72 hours before installation. Be sure to use your moisture meter to check moisture levels in both the sub-floor and the bamboo flooring before installation. If there is a three - percent (3%) or more difference between the two, you should not install the floor. Your sub-floor should remain clean, dry, and flat throughout the installation process. The maximum variance is 1/8" over 8 linear feet. Make certain your floor is also free of dirt, wax, oil, paint, curing agents and other contaminants that would interfere with adhesive bond. Old resilient floors can be covered provided above conditions apply. Wood sub-floors should be sanded level prior to new installation. Concrete sub-floors must have all cracks and holes filled with a cement patching material (Ardex or equal). Concrete sub-floors must be tested for moisture and not exceed three (3) pounds per 1,000 square feet using the calcium chloride test. While Bamboo flooring manufacturers attempt to identify the contents of each carton as "light" or "dark", there remains a range of colors within each category. The color determination is subjective and natural products are unpredictable in color consistency. To avoid color "blotches", the installer should work out of 3 separate cartons, alternating planks from each carton to produce a floor with a pleasing collage of colors. Installers are the last step in quality control and are required to inspect each plank prior to nailing or gluing it in place. 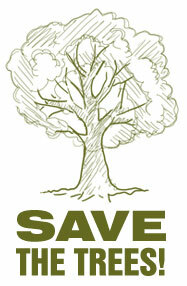 The National Wood Flooring Association standard for defective product is 5%. Many of these off-quality planks can be used as starter pieces or fillers. Excessive moisture or lack of moisture is the primary factor of wood flooring failures. Although bamboo flooring is more resistant to problems caused by moisture thansolid wood flooring, the standard "solid bamboo", it is not an engineered floor but rather an assembled floor and you should use the same installation guidelines as you would for a solid wood floor. Engineered wood of any species or bamboo is inherently more stable than a solid version of the same species. However, these are limits to how any floor covering specie will perform with excessive moisture or absence of moisture. 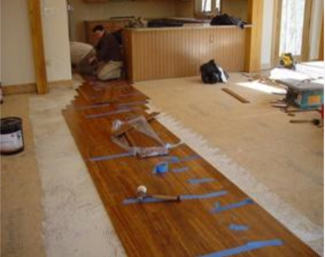 Nail-down: In this method, the bamboo floor is nailed down to a wood sub-floor. 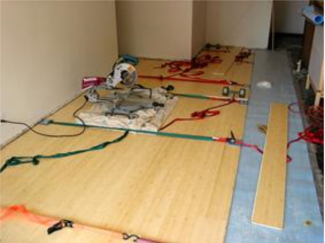 It is the traditional way of bamboo wood floor installation using a pneumatic nail gun with nails, cleats or staples. All solid flooring and many engineered floors can be installed this way. It is recommended to use some sort of underlayment (either felt paper or foam), overlapped, under the bamboo for protection against moisture migration and as a noise reducer. Planks should be started square with the room and parallel to its longest dimension by positioning with a chalk line, leaving a minimum 1/4" expansion space from base plate or wall. Ensure starter rows are firmly in place by wedging, face nailing or using adhesive. Once initial rows are secure, second and further courses shall be blind nailed directly above tongue at a 45-50 degree angle to the face. The floor joists (floor support beams) must be marked to guide installation procedure. Also, the location of floor joists should be marked on the felt paper with chalk lines. These markings will identify where nails and staples should be driven to make a solid connection with the sub-floor. The nails or staples are rammed at an angle through the tongue and are hidden by the next piece of flooring. This is why it is sometimes called blind or secret nailing. Fasteners shall be spaced at 10-12 inch intervals with a minimum of 2 fasteners per piece and a fastener within 3 inches of each plank end. In addition, there are adaptors for other models that can be used. Once starter rows are placed, the next planks should be nailed directly above the tongue at a 45 degree angle. 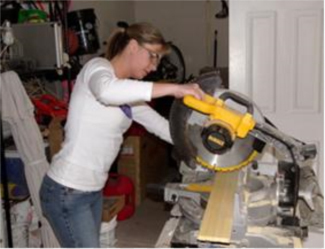 A face nail might be needed in doorways or tight areas where the nailer can't fit. The last two rows will also have to be face nailed in the same manner. A good eye should be kept on nail / staple penetration. NOTE: Particleboard does not provide adequate holding of the nails and is therefore not considered an acceptable sub-floor material. Glue down: A glue-down wood floor is installed in a similar way like that of flooring tile. It can be used for installation on both concrete sub-floors and on plywood. Bamboo flooring should be glued down using a moisture resistant flooring adhesive (especially urethane type). Water based adhesives should not be used for this purpose. Always use a premium wood flooring adhesive, the industry standard is Bostik's Best, but many other adhesives are very similar at lower prices. Follow the adhesive manufacturer's guidelines for safe use, storage and handling. Wear gloves and long sleeves because the adhesive is hard to get off your skin. Read adhesive instructions carefully for proper trowel size and adhesive set time. After applying the adhesive to the sub-floor with a trowel, the bamboo flooring planks should be immediately placed with groove facing the wall. Allow for adequate cross ventilation during the procedure. Start with the outside wall and spread no more adhesives than can be worked with in a forty-minute period (100 to 200 sq. ft.). Clean any adhesive that comes in contact with the face of the plank immediately. Bamboo flooring should be square with the space and run perpendicular to the joists. Starter rows should be held firmly in place by wedging or blind nailing. Once the starter rows are secure, you can use adhesive in a Wet-Lay or Walk-on-Work method of installation. Wet Lay Method: Apply adhesive to substrate with suitable trowel, immediately place flooring onto "wet" adhesive. Walk-on-Work Method: Apply adhesive to substrate with suitable trowel and allow it to develop tack (may take an hour or more depending on temperature and humidity). Install flooring onto "tacky" adhesive. Immediately roll finished installation with 150 pound roller. The room, flooring and adhesive should be conditioned at room temperature for 72 hours before and after installation. 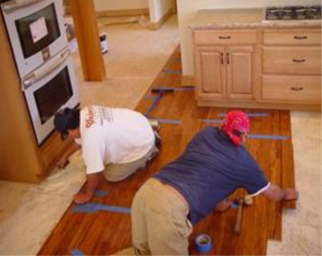 Make sure the floor is still aligned and be careful not to let installed floor move on the wet adhesive. Use damp cloth to immediately remove any adhesive that gets on flooring surface. Walk on the flooring foot-by-foot within 30 minutes of laying the floor to ensure a solid bond with the adhesive. Flooring planks on the boundary line of room may require weight for this bond. Floating Floor: Not all bamboo flooring can be installed by the floating floor method, specifically solid and strand woven products. Wider engineered, radiant heat or cross ply products should only be considered for floating. A floating floor is attached to itself and not to the sub floor. It is installed over various types of cushion underlayment. This method is suitable with any sub floor and is especially recommended for radiant heat or below grade installations. This method involves gluing the tongue and groove joints of the bamboo wood flooring together over an underlay. Start first row with groove toward wall. Glue end-joints of first row by applying adhesive to bottom of groove. Lay subsequent rows of flooring by applying glue to side and end joints and fitting planks together with tapping block.